It started with a photo essay I found online. Italian photographer, Gabriele Galimberti, realized that trying to not overeat over at your grandma’s place has got to be a universal thing, and set out to explore what grandmothers cook around the world. His 'Delicatessen With Love' photo series portray grandmothers from 58 different countries, each posing right before they start cooking and then presenting their signature dish in the end. His own grandma and a dish of her raviolis was what gave Gabriele the idea for the project. I wanted to create a mural out of this photo essay and drew inspiration of the idealism of one of the great restaurants of the world, El Bulli and it's chef, Ferran Andria. Ferran Andria stated, "Why is the family meal so important at El Bulli? The answer is very simple: we believe that if we eat well, we cook well." The idea that this chef would take time out to eat a meal with his staff was outstanding; the idea of building a community through the sharing of a healthy meal was revelatory. 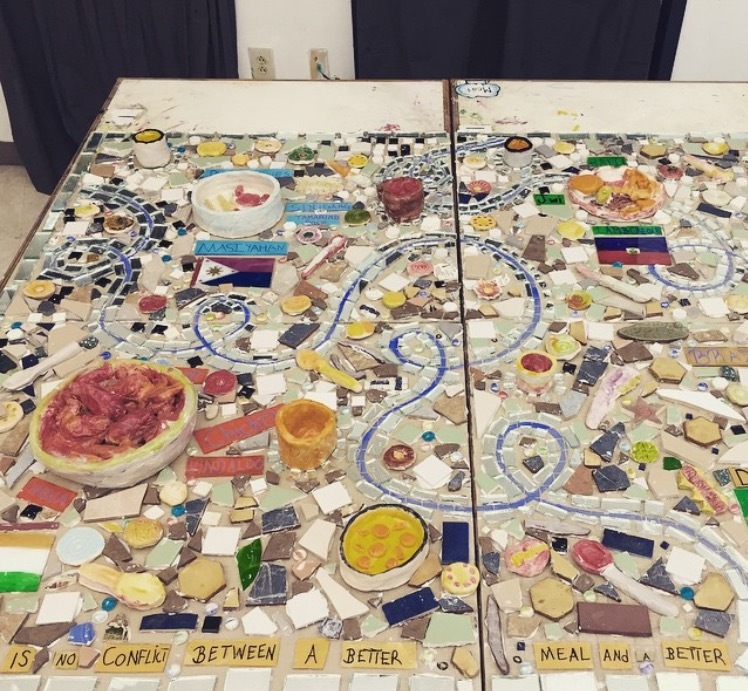 Through the crowd-funding site, Indiegogo, and a generous donor, William Hooper, we raised $2,000 to create 'The Family Meal' with Philadelphia's Magic Gardens. It's super rewarding to raise everything on your own with a lot of help through your friends. Teaching artist, Trish Metzner-Lynch, joined us again (we created one at Southwest Leadership Academy and one at Wissahickon Charter School), directing my class and I from start to finish. She fired our food sculptures and tiles, kept us on track, helped us with assembling all the pieces. Trish is amazing. Philadelphia's Magic Gardens loves working with us, my kids. My kids know that they have two people who want to make sure they succeed and know we believe in them.